Alice Coachman was born on November 9, 1923, in Albany, Georgia. One of 10 children, Coachman was raised in the heart of the segregated South, where she was often denied the opportunity to train for or compete in organized sports events. Instead, Coachman improvised her training, running barefoot in fields and on dirt roads, using old equipment to improve her high jump. At Madison High School, Coachman came under the tutelage of the boys’ track coach, Harry E. Lash, who recognized and nurtured her talent. Ultimately, Coachman caught the attention of the athletic department at the Tuskegee Institute in Tuskegee, Alabama, which offered the 16-year-old Coachman a scholarship in 1939. Her parents, who’d initially not been in favor of their daughter pursuing her athletic dreams, gave their blessing for her to enroll. 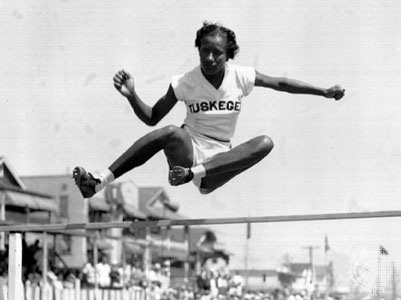 Before she ever sat in a Tuskegee classroom, though, Coachman broke the high school and college high jump records, barefoot, in the Amateur Athlete Union (AAU) national championship’s track and field competition. Over the next several years, Coachman dominated AAU competitions. By 1946, the same year she enrolled in Albany State Colege, she was the national champion in the 50- and 100-meter races, 400-meter relay and high jump. For Coachman, these were bittersweet years. While probably at the peak of her athletic form, World War II forced the cancellation of the Olympic Games in both 1940 and 1944. Following the 1948 Olympic Games, Coachman returned to the United States and finished her degree at Albany State. And although she was formally retired from athletic competitions, Coachman’s star power remained: In 1952, the Coca-Cola Company tapped her to become a spokesperson, making Coachman the first African American to earn an endorsement deal.Later in life, she established the Alice Coachman Track and Field Foundation to help support younger athletes and provide assistance to retired Olympic veterans.In the decades since her success in London, Coachman’s achievements have not been forgotten. At the 1996 Summer Olympic Games in Atlanta, she was honored as one of the 100 greatest Olympians in history. She’s also been inducted into nine different halls of fame, including the National Track & Field Hall of Fame (1975) and the U.S. Olympic Hall of Fame (2004). Alice Coachman died on July 14, 2014, at the age of 90 in Georgia. In the months prior to her death, she had been admitted to a nursing home after suffering a stroke. Coachman has two children from her first marriage. Her second husband, Frank Davis, predeceased her.